I have prosecuted and defended numerous post-trial appeals, including Ording v. Wisconsin State Home Services, Inc.; WED Development LLC v. Re/Max Realty 100; Kosek v. Hanauska; Keller v. Gaszak; Esser v. Higgins; Holz v. First Weber Realty; Lenzke v. Brinkmann Pools LLC; Estate of Ziolkowski v. Mobility Works, LLC; Garver v. Krueger; and Wilhelm v. McCoy Contractors, Inc. If you were the losing party at trial, the number one rule is that you do not appeal the result. Appellate courts will not disturb a jury verdict unless there are absolutely no inferences from the credible evidence to support it. Instead, you have to look for errors in the process that led to the result. Did the trial court err in admitting or excluding certain evidence or testimony? Did the trial court err in failing to strike a juror? Did opposing counsel engage in misconduct in presenting evidence or in arguing to the jury? Did the trial court err in instructing the jury? Did the trial court err in formulating the special verdict questions? Did the trial court err in accepting a verdict with inconsistent answers? However, "issue spotting" is not enough to give you a fighting chance of success. 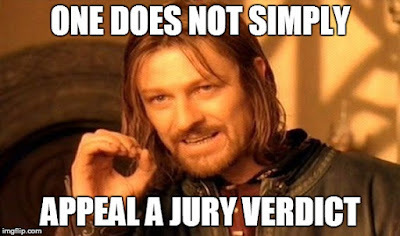 Trial courts generally have the discretion to control the selection of the jury, the presentation of evidence, and the instruction and questioning of the jury. Also, as a practical matter, most appellate judges are former trial court judges who remember the control that they exercised over their courtroom and give their trial court brethren the deference that they would have wanted back then. You have to develop a convincing argument that the trial court applied the wrong legal standard when it barred your expert witness from testifying. You also have to develop a convincing argument that the trial court's legal error likely affected the outcome of the trial. Please contact me at rudolphkuss@stevensandkuss.com so that we can discuss your clients' potential appeal.